The NAA 4 inch barreled Sidewinder is part #NAA-SW-4 in .22 Winchester Magnum Rimfire chambering, part #NAA-SWC-4 with two matched cylinders, .22 LR and .22 WMR. Both feature a swing-out cylinder (or cylinders) with extractors. 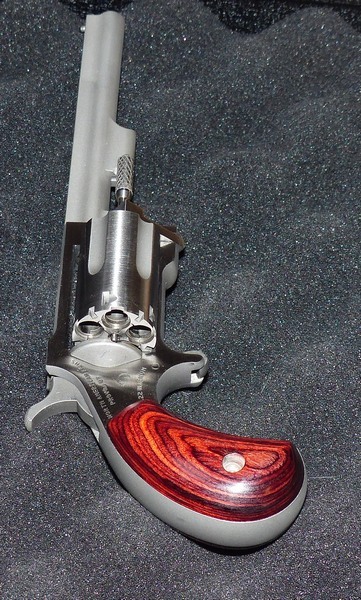 The beauty of the four inch barreled Sidewinder is that the longer barrel makes it extremely easy to hit with, despite the small snag-free front post sight. It is roughly a half pound package and easily fits where many handguns do not. Concealed carry reduces crime without question, and prevents you from becoming a victim. Conceal carry permit holders are among the most law-abiding citizens on the planet. 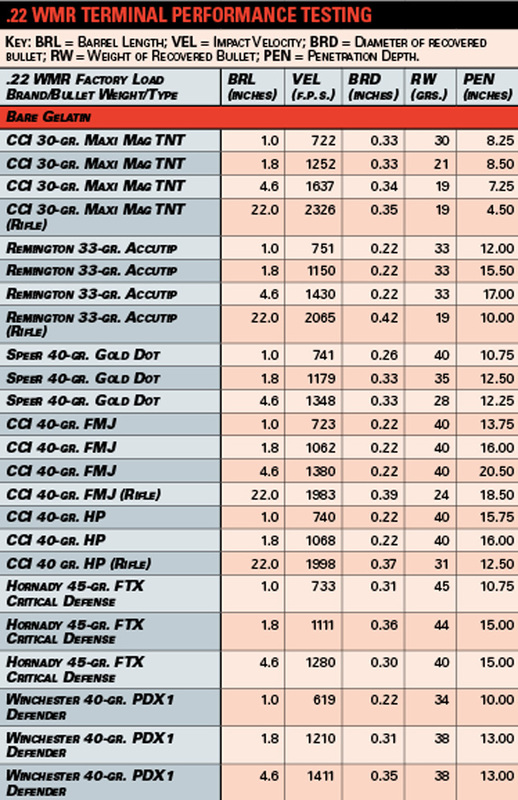 While the .22 WMR at one time was a snake-level cartridge out of a handgun, that has changed in a big way with the introduction of loads like the Hornady 22 WMR 45 gr FTX® Critical Defense® that has penetration similar to the better .380 ACP self-defense loads. In fact, you are looking at around 1250 fps and 15 inches of penetration from the 4 inch NAA Sidewinder with the Hornady load. A problem, even with folks that normally do carry, is the times that they do not carry based primarily on the convenience factor. You can pick up the NAA 4 inch Sidewinder in .22 WinMag for about $370 street price, the conversion model with both .22 WinMag and .22 LR cylinders for about $460. The longer 4 inch barrel does a lot of good things: reduced muzzle flash, reduced muzzle rise, and a bit less noise as well. 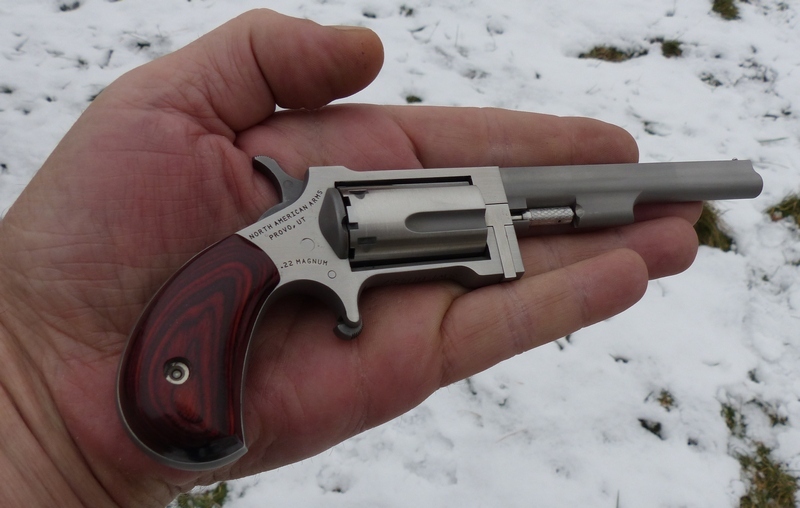 Not everyone considers that in an unexpected self-defense scenario, shooting a large caliber snubnose revolver (for example) will leave you disoriented: temporarily deaf and blind in some situations. Fire a handgun without hearing or eye protection indoors in low light and you'll know what I mean. The NAA 4 inch Sidewinder addresses these problem areas as well. There have been several books written along the lines of “Thank God I Had A Gun!, but nothing written about “Thank God I Was Unarmed,” which should surprise no one. Whether young or old, or somewhere in between, the NAA 4 inch Sidewinder is very easy to use, far more effective now than ever, and is a very handy, well made instrument that provides defense of self and others. "As of the beginning of this year, there were over 14.5 million concealed carry permits in the US. That represents a 215% increase in the number of permits since 2007. Since then there has been an increase of about 100,000 permits in just Florida alone, so the total is probably near to 15 million now. Yet, those numbers are clearly an underestimate of the number of people who can legally carry because there are 12 states now where you don’t need a permit to be able to carry, and while some people in those states still get a permit to be able to carry outside their state, the number of permits in these Constitutional Carry states does tend to fall. The biggest increases in permit have been for women and for minorities. The number of women with permits has increased twice as quickly as the number of men with permits . . ."